There are some half a million miles of hedgerows in the UK dividing up our agricultural landscape. Within them an abundance of healthy and tasty plants are growing, just waiting for you to pick and eat. With a wealth of wild flowers available in these hedgerows we have huge resource for foraging food, beneficial to our health, as a natural alternative to items found in the supermarket! Harvesting plants is not only fun but is a great way of connecting with the natural world. The hedgerow is a piece of living architecture telling a tale of human progress through many centuries. The Romans began planting thorn hedges around their properties and Anglo-Saxon hedgerows can still be seen in some places but it was during the mediaeval period where population expansion saw agricultural improvements that hedgerows were planted extensively and this continued into the 19th Century with the Enclosures Act. 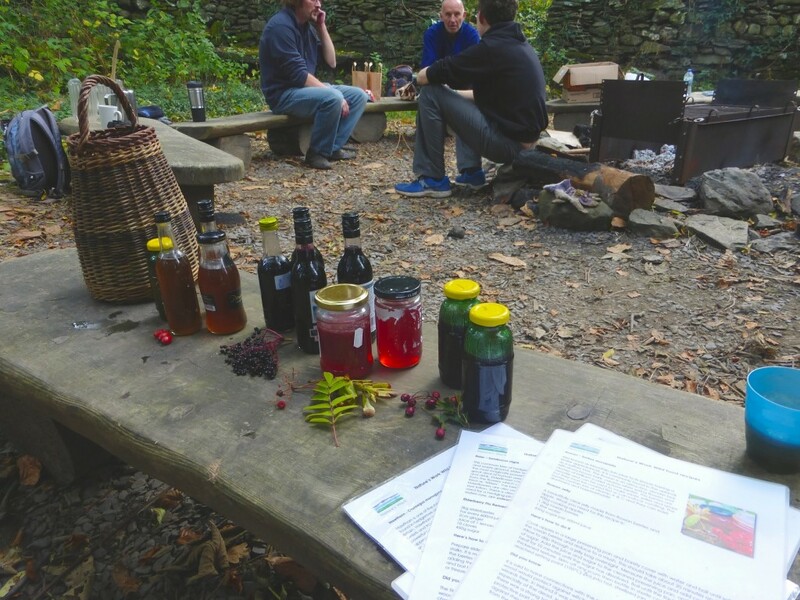 Whether your interest is in identification, cooking, health or natural medicine, the following gives a starting point for your botanical explorations. It is based on my own observations, culinary experiences and from researching herbalism and wild food recipes. The dandelion is a perennial plant with lance-shaped leaves. Its name comes from French ‘dent de lion’ given to the jagged shape of its leaves. 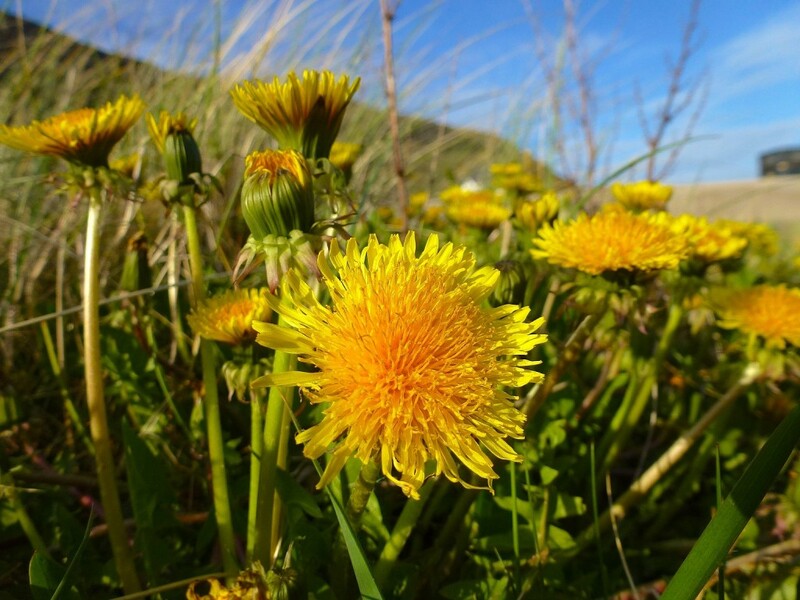 All parts of the dandelion are edible and its medicinal effects are to strengthen the entire body, especially the liver and gallbladder, where it promotes the flow of bile, reduces inflammation of the bile duct, and helps get rid of gall stones! Culinary ideas: The taproots can be collected all year round, although they are best in the spring, and used as a cooked vegetable. To make an excellent Japanese miso soup simple add to a potato stock, add onions, tofu, ginger, carrots and miso. You can also make Dandelion coffee by air-drying the roots for several days in a sunny spot then roast for a few hours before grinding and adding boiling water. The nettle is a highly successful plant found all over the UK. Its jagged leaves occur in pairs along the square stems and are easily recognisable particularly after having experienced the sting! Nettles prefer rich soils and therefore do well around human settlements benefiting from the waste we produce. Nettles are an incredibly rich source of Iron and can make an excellent tonic for the circulatory system. They are also great for sufferers of asthma, eczema, hayfever and arthritis. Culinary ideas: Simply collect a few nettle heads and add boiling water to make a tea infusion. 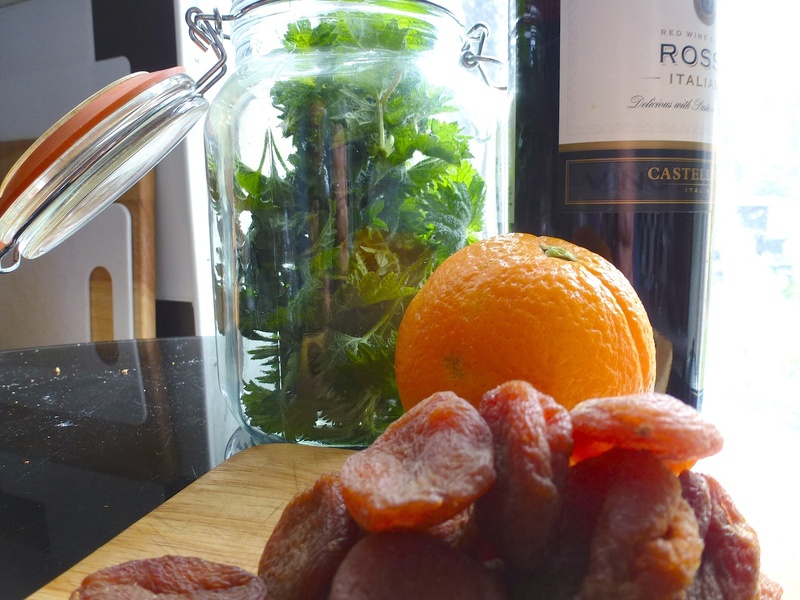 To make an iron-rich tonic pick 20 nettle heads, chop up 10 un-sulphured apricots, add the zest of an orange and pour in a bottle of 12-14% red wine! Shake daily for 2 weeks then take 1-2 dessertspoons once daily. This common tree of hedgerows and woods was once regarded as one of the most magically powerful plants. It is thought that its name comes the Anglo-saxon ‘aeld’ meaning fire because its hollow stems could be used to blow air into the centre of a fire like bellows. Elder has had a great deal of human uses over history, mostly for food and drink. In spring the flowers are used in many ways from making cordial and champagne to being dipped in batter and fried to making a skin cleanser and eye lotion. Please note that the berries, eaten raw, are poisonous. Culinary ideas: Elderberries provide a superb natural flu remedy. 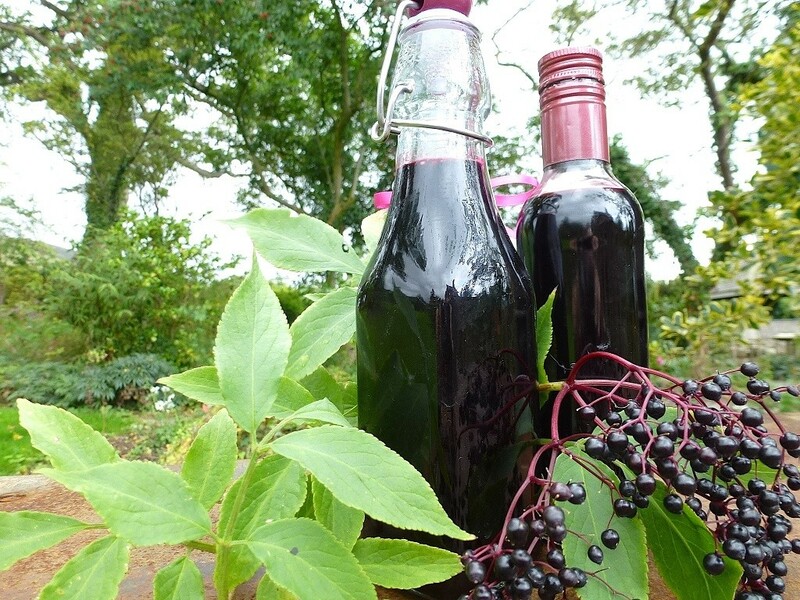 To make an elderberry cordial collect 2kg of elderberries and boil for 30 minutes in enough water to cover the berries. Remove from the heat and sieve the mixture. For every 600ml of juice collected add 450g sugar and reheat until the sugar has dissolved. Finally boil hard for 10 minutes with root ginger, lemon juice and cloves then sieve and bottle the cordial. Hawthorn is one of the most common species of tree found in hedgerows and woodland throughout Britain. It has more connections with ancient beliefs and traditions than almost any other tree. The appearance of the May blossom was to herald the end of winter and the onset of summer. Often the May Queen was crowned with May blossom. Hawthorn has the ability to reduce cholesterol, hypertension and it contains compounds which increase blood flow and alleviate angina. It makes a great tonic for the heart. 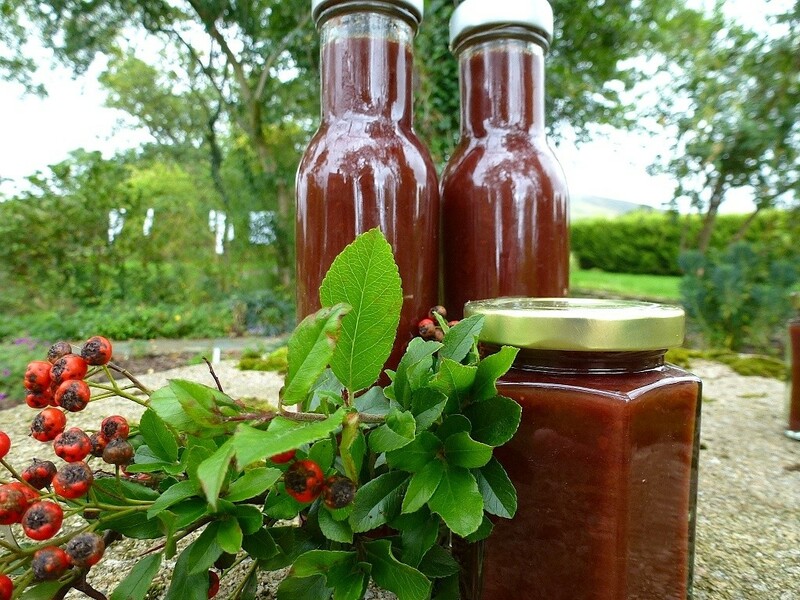 Culinary ideas: Fruit leathers can be simply made whilst sitting around an open fire but my favourite recipe is to make ketchup. Prepare and clean 1kg of haws then boil for 30 minutes in vinegar water (600ml of each) for 30 minutes. Sieve the thicken mixture (quite hard work) then reboil for 10 minutes with 340g of brown sugar, salt, pepper, cloves and Star anise. Once ready pour into sterilised bottles and enjoy. 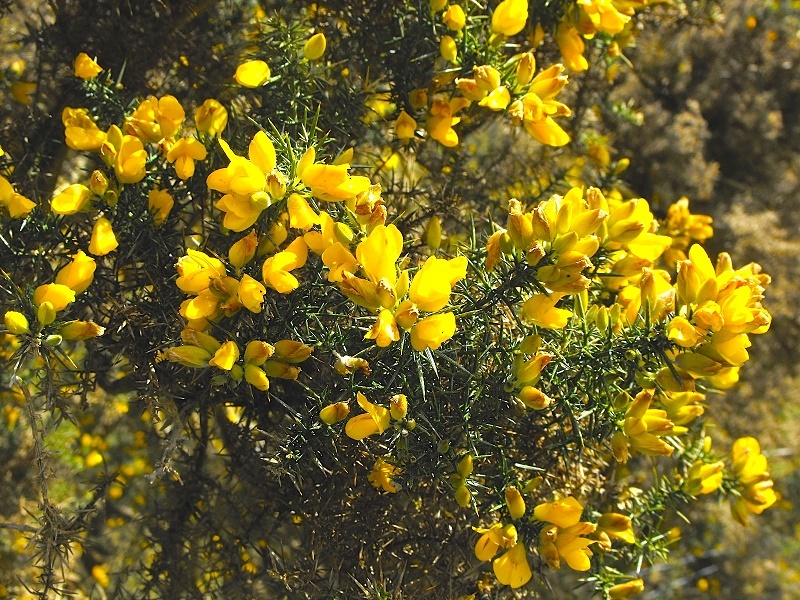 Gorse is a common shrubby plant with sharp thorns and scented golden-yellow flowers reminiscent of coconut! The young shoots were eaten during the Irish famine as an emergency substitute food and the flowers have been indicated for ‘despair’! It is known to the herbalist Dr Edward Back as one of ‘The Four Helpers’. It has been used to make soap from the burnt ash remains after making a fire! This alkali ash is mixed with clay and rolled into balls or added to water to make a paste. 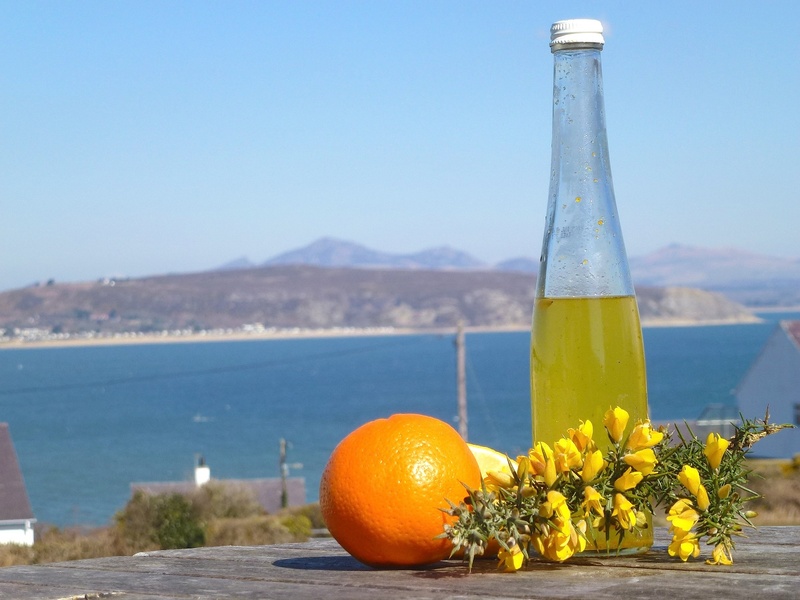 Culinary ideas: Gorse flower syrup is a lovely refreshing drink and is simple to make. Boil ½ litre of water and 125g of sugar on a strong heat for 10 minutes to make a syrup. Remove from the heat and add 4 handfuls of fresh Gorse flowers and the zest of an orange and a lemon. Let the flowers and zest infuse the syrup for 5 minutes. The yellow dye from the flowers will give the syrup a golden colour. Strain through a sieve and enjoy as a ‘spritzer’ with sparkling water. Alternatively freeze the mixture to use as a sorbet! This aromatic plant is found on lawns and grasslands and has tiny pinkish-white flowers arranged in clusters called ‘umbels’. These appear on stalks with delicate, feathery leaves. Yarrow has a ‘cure all’ reputation and its healing traditions date back to Celtic times. Achilles, the Greek warrior, healed the wounds of his men during the Trojan War with Yarrow. It is used as a treatment for the common cold, flu & fever, indigestion & diarrhoea, toothache and bleeding. It is also effective for relaxation, well-being and as an aphrodisiac particularly for women! Culinary ideas: Simply collect a few leaves or flowers to make a delicious infused tea. Alternatively add a slice of lemon and sweeten with sugar. Yarrow can also be used as a salad plant making a fine addition to a green leaf salad or as a substitute for dill when cooking fish.